As part of the Canadian Association of Pathologist Annual Meeting in July, several members of LMP and our partner hospitals will be leading education sessions for visiting laboratory professionals from across North American that will be attending the conference. More information can be found online HERE. We sat down with a few of our Pathologists’ Assistants, Sarah James from UHN, Andrea Axente from Sunnybrook Health Sciences Centre and Jessica Swain from Lakeridge Health, who have been working together on several different educational sessions for the Annual Meeting. We asked them about their individual sessions, their commitment to continuing education and why this type of cross-partnership collaboration is so important to laboratory medicine. Sarah: I’m leading a session called “LIVER: Segments, Lobes and hepatectomies.” This workshop will include a review of liver anatomy, types of liver resection, and how to describe and sample these specimens for benign and malignant lesions and other liver pathology. I’ll also have wet tissue specimens available for gross review. Jessica: I am leading a “wet” workshop entitled “Radial Margin on the Right Side; Where is it?” on assessing a specific – “radial” surgical resection margin on colon cancers in the right colon. This will involve using a few specimens for demonstration. The goal of the workshop is to discuss the application of the guidelines set out by the CAP cancer checklists on assessing the surgical margins in Rhemicolectomy specimens and to ensure understanding of the anatomy in this area and the terms used to convey the margins in the gross description. Andrea: I’m going to be leading a session on the lower urinary tract, focusing on bladder and prostate specimens of the genitourinary system. I think most of the PA’s attending the session will be at least familiar with how to ‘gross’ these specimens – so my goal is to get us all to discuss how we might process these specimens differently (or similarly) across different institutions and to educate all of us on different techniques. What sort of work has gone into your presentation? 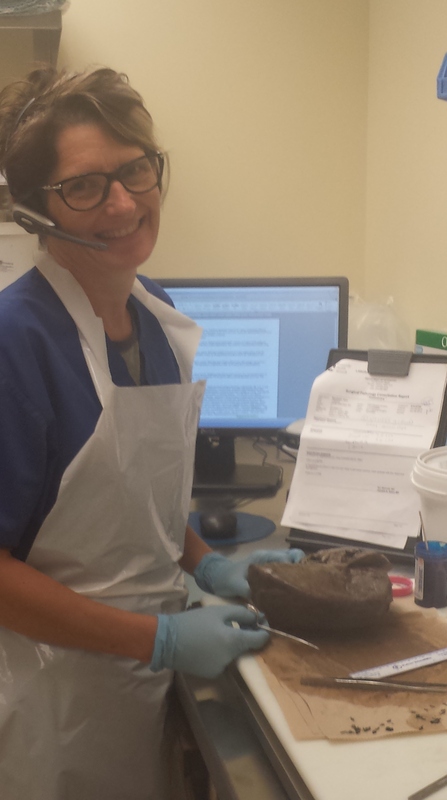 Sarah: I have prepared theoretically for the workshop by attending a liver lecture, reading about liver anatomy and pathology, reviewing the staging criteria for liver pathology and reviewing liver pathology gross dissection. Practically I have grossed lots of livers, taken lots of photos of liver and have placed some livers with interesting pathology aside so that we can look at them during the workshop. Jessica: I will began by discussing the concepts and application of the CAP guidelines with my colleagues. I compiled case number and photographs of cases to present. I have also referred to surgical techniques and watching video of the actual laparoscopic surgery. From there the actual presentation and ideas for discussion at the workshop were developed. I have also reviewed the presentation with our GI pathologist from LH/UHN, Dr. Sara Hafezi-Bakhtiari. Andrea: I have prepared a presentation and handout for the workshop attendees. There will be specimens there that we can work through together as a team. However, my main focus will be group discussion. At the end of the day we follow our protocols at our respective institutions, but it is important (and interesting!) to see that there is more than one way to gross a specimen! Who may attend the session? Jessica: The session is geared towards anyone who will gross these specimens – PAs, residents, and Pathologists (including pathologists who sign out these cases but may not gross them). Tell me about some of the other sessions for laboratorians at the CAP conference? Sarah: I wanted to make sure we had lots of workshops in order to provide a great learning experience that was interesting to many so I reached out to my colleagues across Toronto and our partner site at Lakeridge. Knowing that Lakeridge and Sunnybrook would be too far away to access I offered them space at UHN to hold their workshops. We have held meetings and stayed in touch by e-mail to make sure the workshops have a similar format. How did the PAs between UHN, LH and SHSC connect? 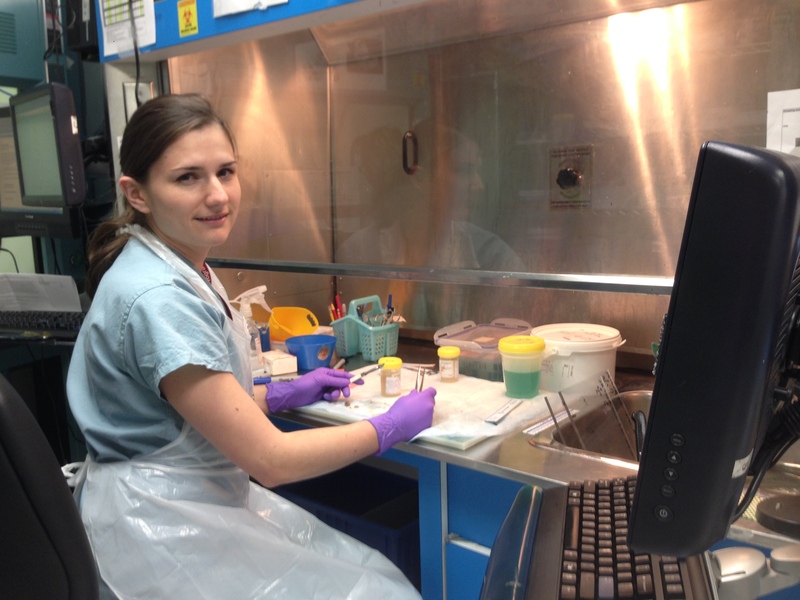 Sarah: I talk to the PAs at Lakeridge Health on a regular basis as we share pathologists and procedures! I first asked their supervisor if he thought they would be interested in participating and he took it forward to the team there. At Sunnybrook, I asked a colleague who is part of the group I organize to teach at PgY2 school (summer school for incoming pathology residents) if they were interested in leading a session. 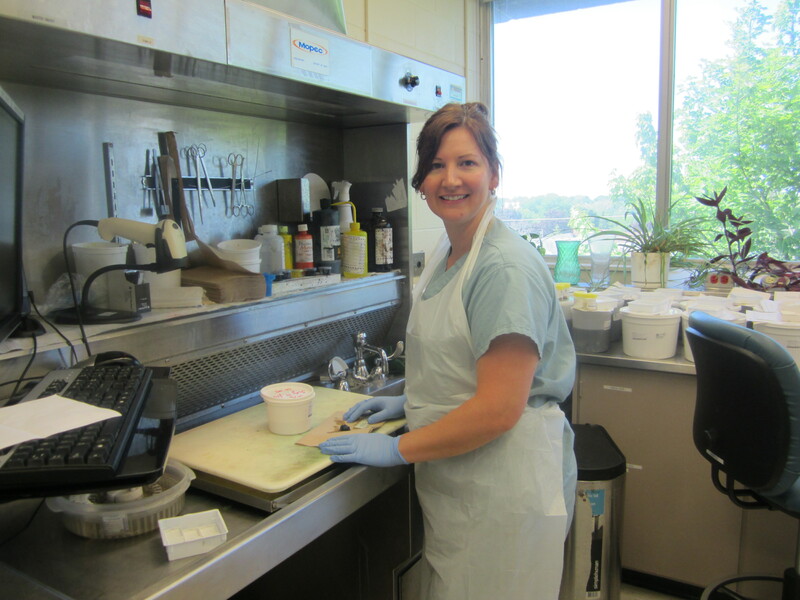 Andrea: I have tried to attend as many GTA PA rounds since moving to Toronto and working at Sunnybrook two years ago. This is the main form of communication we’ve shared. We come together to listen to a talk and discuss our ideas and thoughts during the course of the presentation. It really has been a great way to get to know the PAs in the community and to learn from each other about our own profession and how it’s developing across different hospitals. Why do you believe this type of education is important? Sarah: Even though there are now three master’s programmes for PAs in Canada, most PAs are still trained “on the job.” We are a hands-on profession. It’s the stuff on the grossing bench that unites us. The grossing bench is our classroom and its where most of us learned initially. This is the only opportunity for PAs across Canada to come together, compare techniques and learn from each other at the grossing bench. Andrea: I think this type of education and workshops are important because it offers a hands-on experience which the traditional classroom cannot always offer. Because the workshops will be held in small groups, it will allow for easy conversation/discussion among all of us. Why do you believe these connections are important? Sarah: No one person can do it or know it all! Connecting with my colleagues allows me to continue to grow as a PA inspired by new perspectives and ideas presented by them. And, as I learned from a session I just attended, talking to people who do the same job as you relieves stress. I’d like to give a big thank you to everyone leading a session and the Surgical Pathology volunteers, Zer, Jeff, Jong and Lina who will be assisting our guests, presenters and attendees at UHN on the workshop day. It should be fun and informative! Jessica: The connections are very important because of the creation of support, mutual understanding and standardization. We all work under the same guidelines and are part of a broad team that shares the same goal – giving the most accurate diagnostic information to the pathologists. Andrea: Being a PA means being part of a team both within the hospital, and within the community. We all work in the same field, but we all have different techniques and slightly different processes. Our discussions are always enlightening! Sharing information and ideas amongst each other make us better informed, which make us all around better PAs.